While Israel is mired in domestic scandals and coalition crises, the greatest threat the country has known since the eve of the Yom Kippur War--perhaps since the War for Independence--is steadily taking shape. This menace, posed of course by Iran, essentially consists of a wide range of growing threats closing in on us. 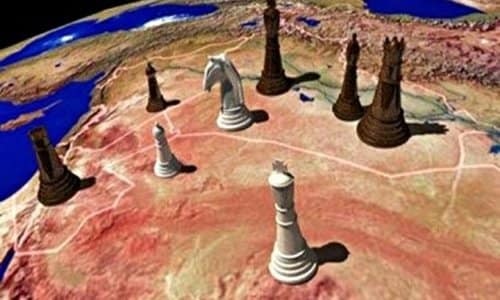 The Iranians, who invented the game of chess, are exceedingly adept at playing several boards simultaneously, with the winner's prize no less than control of the entire Middle East and beyond. The bottom chessboard is regional. The Iranians cunningly took a step back and allowed the superpowers to destroy their main enemies in the region. The Americans weakened the Taliban and eliminated Saddam Hussein, and, along with Russia, they annihilated the Islamic State group. The Iranians also helped Shiite militias exhaust and chase American forces from Iraq. The resulting vacuum in Iraq and Syria was filled by the Iranians and their proxies. Today, Iran is penetrating deeper across the Middle East and is guiding the Shiite majorities in eastern Saudi Arabia and Bahrain. It has also established a foothold among the Houthis rebels in Yemen. Just several days ago, Bahraini forces thwarted a coup attempt orchestrated by the Iranian Revolutionary Guard Corps. At the same time, the Iranians have forged unprecedentedly strong alliances with Hamas and Palestinian Islamic Jihad. Together with their complete control over Lebanon, the Iranians have laid siege to virtually the entire Middle East. The upper chessboard is the international sphere, where the Iranians have secured a nuclear deal. This achievement grants them all the advantages of military nuclear capabilities without the costs. While Iran doesn't have to fear a military strike on its nuclear facilities, sanctions relief and lucrative business deals have provided the immense funds it uses to realize its regional aspirations. In around 10 years, when the nuclear deal expires, no country will step in to stop Iran if it continues developing nuclear weapons, for fear of squandering its vast investments in the Islamic republic. In the meantime, the Iranians have displayed an incredible capacity to maneuver between Western powers. Thus, for example, during Tehran's rapprochement with Washington under the Obama administration, it also struck a tangible military alliance with Russia, which helped it restore its status as a player in the Middle East. This dexterity is particularly discernible on the main chessboard: Syria. Influence in Syria, which links Tehran to Beirut; and Damascus to Iraq and the Persian Gulf, is a preeminent Iranian interest. In Syria of all places, however, Iran's status is questionable due to the lack of a Shiite population there. Therefore, it is working to cleanse Syria of its Sunni majority and bolster the Alawites, who are essentially an offshoot of Shiite Islam, and their regime. To replace the banished or killed Sunnis, Iran is importing Shiites from across the Middle East from as far as Pakistan and Afghanistan. To this end, the Iranians enlisted Moscow's help and in return agreed to Russia's continued presence in the war-torn country. Through their extensive economic ties with Iran, meanwhile, the Europeans are funding the ethnic cleansing of Syria and inducing the tsunami of refugees reaching their shores. All Iran has to do now is establish a military foothold in Syria to overcome the last obstacle on its path to regional hegemony: Israel. Iran wants to force Israel into a state of perpetual check; in other words, paralysis before death. Surrounded by tens of thousands of missiles held by Hamas and Hezbollah, and in range of the Iranian army's long-range missiles, Israel will struggle to impede Iran from entrenching itself in Syria. When this undertaking culminates, the Iranians will be able to take the Israeli "king" and declare checkmate. This can be prevented. The Israeli government has thus far set clear red lines prohibiting the Iranians from building missile bases and ports in Syria, and from transferring sophisticated weaponry to Hezbollah. These red lines must be stringently enforced, but international support must also be enlisted. Israel has to develop a diplomatic and legal "iron dome" capable of defending us if Israel Defense Forces's soldiers are forced to enter Hezbollah's strongholds in southern Lebanon. The Iranians might be experts at chess, but rest assured, Israel has champions of its own.